Coach Hamish provided a swim analysis to Pro triathlete Eleanor Haresign recently. The winner of Challenge Weymouth earlier this year, Eleanor is a great all round triathlete with no weaknesses, who is looking for marginal gains to help her improve in all disciplines. Already a very good swimmer, she's only giving up 3 minutes or so over the lead women at races like Ironman Lanzarote - so even very small improvements are going to be worthwhile for her. Having had a great season, finishing 10th at Ironman Lanzarote and 14th at Ironman Barcelona, she's now looking at ways that she can find those last few percent gains to get her onto the podium in 2015. Coach Hamish spent an hour with Eleanor and identified three key points that are really going to help her bridge that gap to the lead pack next year. Wow! I didn’t know what I was expecting in the way of followup feedback but this is brilliant! It’s so good to have this to reference to as there’s a lot of into to take in on during the session and I wouldn’t have remembered it all as comprehensively otherwise. Great to see a pro triathlete leaving so happy with their swim analysis. 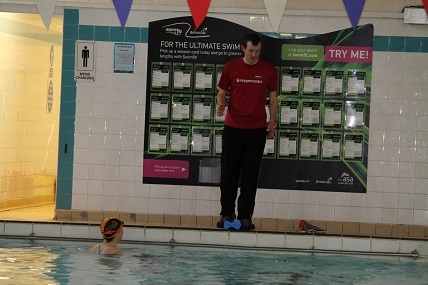 We've got a few more Pro triathletes lined up for their swim analysis in the new year - watch this space! Coach Rob caught up with Ellie afterwards for an interview for the Cup Of Tri podcast which will be live w/b 22nd December. Ellie is great fun and a lovely person - we'd love to see her up on the podium next season! You can read more about Ellie and her swim analysis experience on her blog here: Eleanor Haresign video swim analysis .